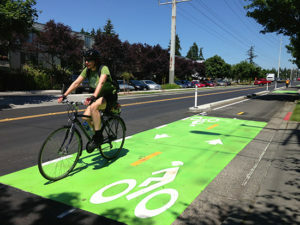 The start of a bike lane backlash in Seattle? Over the last few days, two different articles have been published about the dire state of traffic congestion in the greater Seattle area. 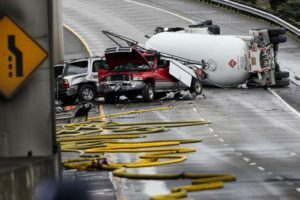 The first is from the Seattle Times where they begin by detailing the absolutely dreadful traffic from Monday Feb 27th due to a propane truck rolling over on I-5, closing down the freeway as well as parts of I-90 for much of the day. While this ultra-rare closure of I-5 and I-90 caused massive traffic carnage in the city, it was certainly not representative of the typical daily traffic issues Seattle faces. I wonder what the Times would have thought if Seattle created bike lanes by reducing parking capacity rather than traffic capacity … I suspect their argument would remain unchanged. This story alone isn’t all that surprising as they pop up every few months as a commentator or some other talking head had a bad day in traffic and decided to write about it. What’s interesting is just days later, MyNorthwest.com posted a different article targeting a very different demographic, but having a similar message regarding bike lanes. So in this case, adding bike lanes in the very areas where the majority of humans want to travel is “forcing bike lanes to compete with car traffic”. That’s an odd position to take. Could the same be said for crosswalks which can be directly connected with slowing down the flow of traffic in the city? Why would people want to cross the street in the most popular places in the city, can’t they see everyone else wants to drive through there? He goes on to question the efforts of the largest bike lobby in the state, the Cascade Bicycle Association (disclaimer, I’m a paying member) saying that he doesn’t understand they “have cars too”. Well of course they have cars, almost ALL cyclists have cars, we can even get special license plates for our cars that let others know that we also ride bikes. There is also little talk of the ample public car storage (aka parking) that soaks up a significant amount of our available traffic bandwidth. This is because every driver also likes to park somewhere other than a personal 2-car garage. There is no “us vs. them” angle because all drivers are also car parkers. I point out these two articles not because they are new and different, I point them out because I found it interesting that two different Seattle area news outlets felt compelled to put bike lanes in the cross hairs as one of the sources of Seattle’s traffic issues just days apart. It’s as if this is a coordinated messaging campaign about how bike lanes cause traffic issues.